Mother of 2. Son has atypical right club foot. Doctors are terribly mistreating club foot. It makes me want to scream, and blog. Today was a special day, June 3, World Clubfoot Day. I never knew I’d care so much about Clubfoot. Now, I can barely remember a day where I didn’t explain what Clubfoot is, tell someone about my son being in casts from four days old, or share about my family’s adventure in Iowa (yes Iowa). Iowa is the land of Oz for Clubfoot in case I haven’t told you lately. Dr. Morcuende is the wizard as far as I’m concerned. Dr. Ponseti was the first wizard, but he was mortal and passed away. Today, June 3, 2014 Dr. Ponseti would’ve turned 100 years old. I wish I’d met him, but I’m also glad that my Clubfoot superhero was born later, born in this time of social media and insta-communication. He’s better off. I’m better off. Everyday my mind races. If mind racing burned calories I’d be about 115 pounds and have six pack abs. I stress about proper Clubfoot care, boots, bars, sores, e-stim, physical therapy, stretches, etc. I look at my son’s foot more than I look at his face. I drive myself crazy over it, but when I do look at his face he’s usually smiling or laughing. I’m so lucky to be his mom because he puts my life in perspective. My non Clubfoot daughter does too. Today Maven wished everyone we saw a “Happy Clubfoot Day!” Family members and friends posted on Facebook about Seager’s Clubfoot Journey. Parents from all over the world celebrated Clubfoot. The pictures and stories were all so unique yet so intertwined. The joy it brought me to see all of the pictures and words is unable to be fully expressed. In further exciting news, I co-admin a page called Clubfoot Journey (find us on Facebook or at http://www.clubfootjourney.com) As of today we are a Non Profit!! We are recognized by the federal government and already helping Clubfoot parents, adults, and children worldwide. 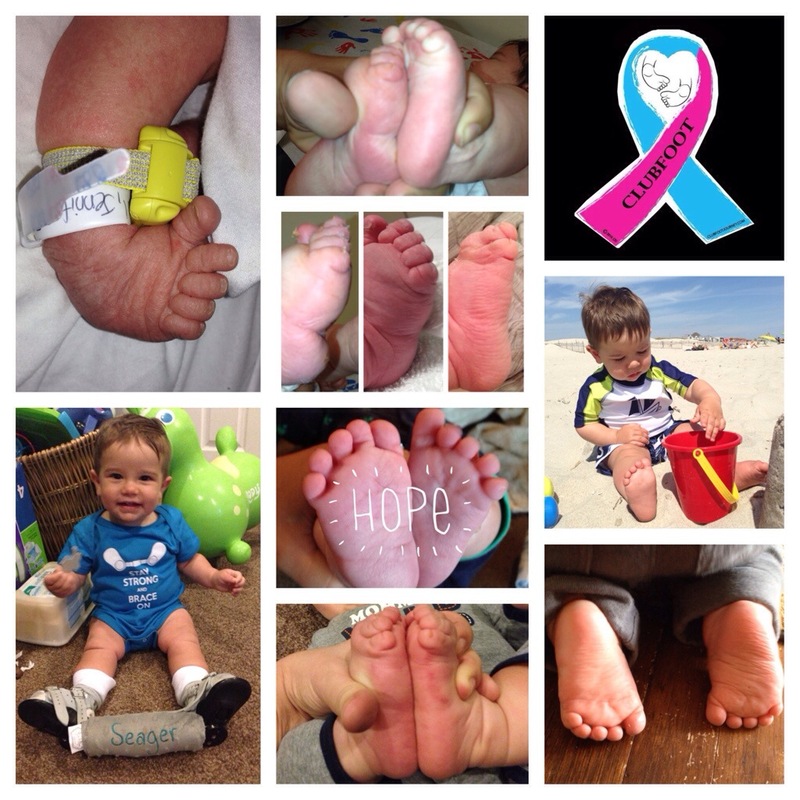 We’ve only just begun our Clubfoot Journey, but even the longest journey begins with just one step. I told Seager’s physical therapist that today would’ve been a great day for Sea to start walking. He didn’t, but he’s getting closer everyday. I’m so proud of my son. He made me part of this Clubfoot “club” and I wouldn’t trade this life experience. His strength and resilience make me stronger than I ever knew I was. Last year on World Clubfoot Day I was trying to figure out the logistics of a 19 hour drive to Iowa with my two children under the age of two. We made it and lived to tell our story. This year, I am in a better place. Winston Churchill said “If you’re going through hell, keep going.” – I’d add to that, one step at a time.